~ A man should never gamble more than he can stand to lose. It is this very thinking that led to the creation of what ultimately became “The Lost & Found Boat”. The “need” for this pirogue arose from our enjoyment of a particular beaver marsh that had that all-too-common tragic combination: it had plenty of ducks but was almost impossible to get to – at least with the hillock of gear needed (there’s that word again…) to do it right. In years of low water – Lazy Beaver Syndrome – it could be hunted with waders, at least parts of it. But, you had to be careful. Unless you could find footing on the submerged remains of an abandoned dam, picking up decoys or birds was almost impossible: the bottom of this marsh is as dangerous a mire as I have ever encountered – being pulled relentlessly down to one’s demise is a real possibility. This is a place for a boat. Any canoe would do, even a jonboat. The problem was getting it there. We could not get permission from any of the nearby landowners so our journey – better described as a”trudge” – was a about a mile – each way, of course. It was relatively flat, but only because it was railroad track. It was struggle enough for a crew of middle-aged gunners with the guns and waders and a few decoys, but carrying any boat that far was beyond the pale. We tried a wheeled vehicle once but the oaken ties made the “ride” pathetically bumpy and downright unmanageable. The only practical solution was “the stash”. Dedicate a vessel to this site for the season and “store” it where no one would discover it. We actually did this one season with a 15’ Grumman. We carried it in during “the split” – the closed period between the first and second halves of the open seasons and carried it out when the marsh was frozen hard. No harm, no foul, but…we were just lucky it wasn’t taken. 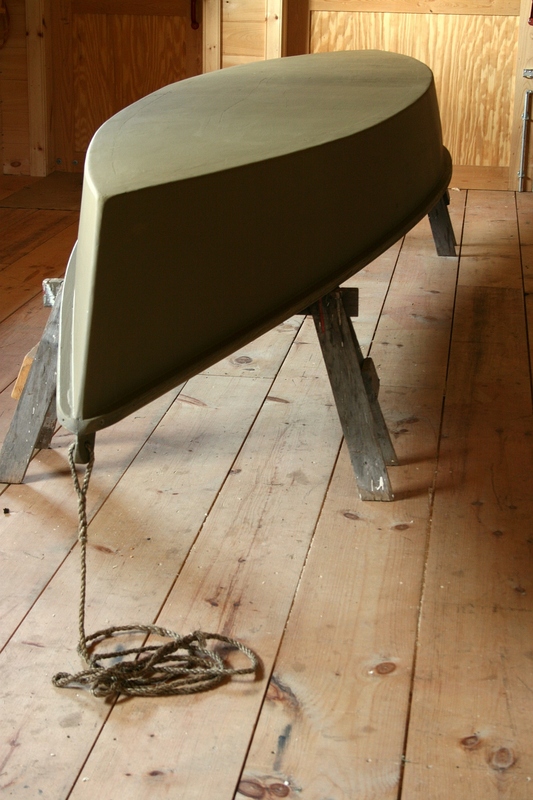 We would hate to lose that canoe, so, suppose we built a boat we could stand to lose….??? There is not much involved in drawing the plans for a pirogue, but I’m sure the notes from many a meeting at work during the off season were “appended” with sketches – of a little flat-bottomed craft that could be gotten out of maybe just a few sheets of ¼-inch plywood. She needed enough room for two gunners and a bag of Mallard stool. Propelled by paddle she would need a couple of thwart seats – which could also stiffen the topsides – and she would have to withstand a little windowpane ice. Of course, too, she needed to look like a boat – with a sweet but gentle sheer. Most important, she was to be a “hundred-dollar boat”. The material costs should be about a hundred bucks so that, if we lost her, no big deal…. A late September detour to Home Depot – on my way home from work in Albany – resulted in 3 sheets of carefully-selected ¼” AC plywood and a single 16’ length of treated decking – the usual 5/4 X 6 southern yellow pine – again selected with an eye for grain that was straight and clear. The plywood sheets were scarphed together end-to-end – the 1-on-8 scarphs were beveled with my belt sander and glued with marine epoxy, “clamped” with barbell weights on the garage floor. The decking board was ripped on the table saw to make both chine logs and both rubrails. I cut the rubrails from the outsides first – because the edges were already rounded over at the factory. The middle of the board was split into the two chine logs. The single bevel cut accounted for the desired flare in the topsides. 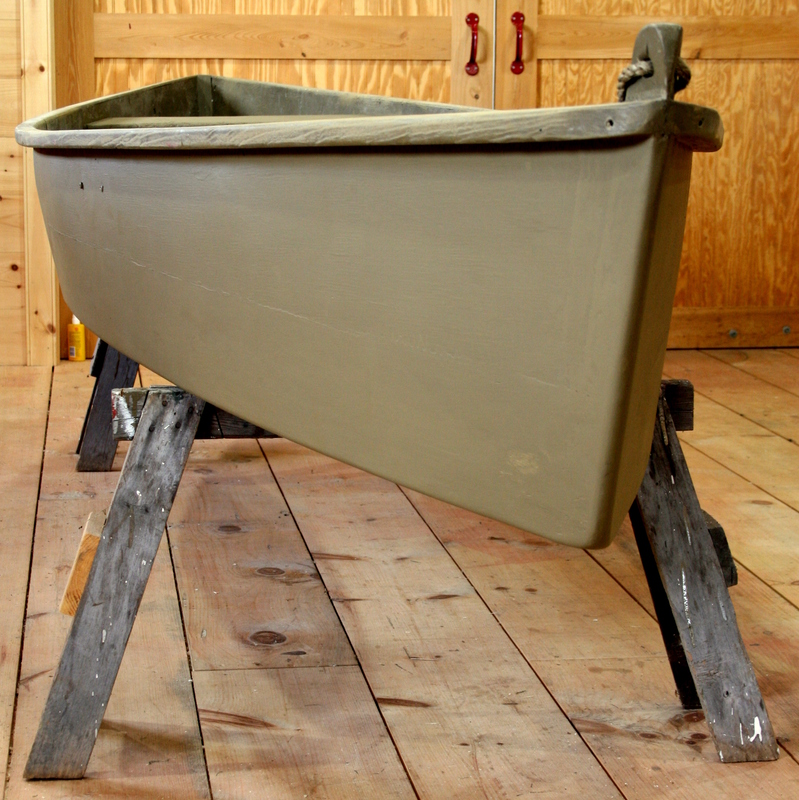 I assembled the boat upside down over 3 molds that I screwed to a 2×4 ladder frame up on sawhorses. 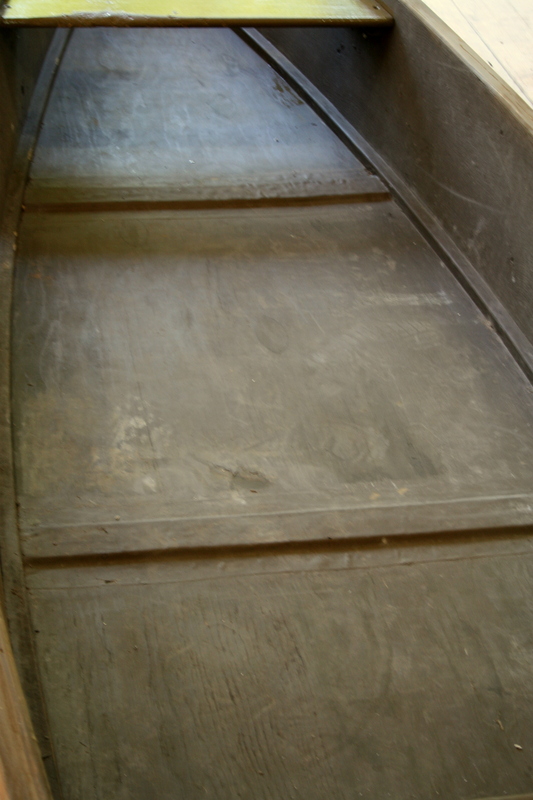 The chines were nailed to the bottom board first – using Liquid Nails because, after all, this is just a hundred-dollar boat – and then the bottom board was screwed (temporarily) to each of the 3 molds. The sides were cut to a generous curve along what would become their bottom edges – starting at 12 inches amidships and sweeping wider (taller) toward the bows, to a generous 15 inches. The rubrails were then nailed (again with Liquid Nails) to the outside of the straight edges. Now the best part. I started nailing the sides to the chine log at the middle mold (station). As I worked toward each bow, I used a combination of clamps and muscle and eye to get the shape I wanted. I wanted the bow to sit right at the waterline but I wanted the stern to tuck up out of the water just a bit. And so, I squeezed and hammered and measured and made my way toward each end, switching back and forth between port and starboard as I went. Once the sides were fastened, I then fashioned stems for each end. I used short lengths of treated 2×4 and beveled each to mate with the angles formed by the sides. 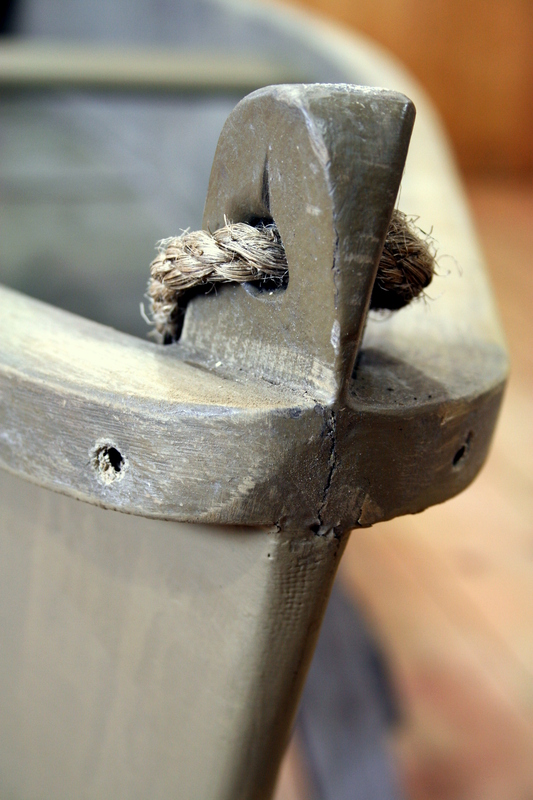 Once fastened – again with bronze boat nails and Liquid Nails – I bored a 5/8-inch hole in the forward stem to receive a half-inch line. Next, I used bar clamps to “adjust” the beam until it looked right: a little flare in the sides and still a pleasing sheerline. I shaped and fastened wooden cleats fore and aft to support the 1×10 pine thwart seats and then fastened the seats. When the bar clamp was removed I detected no springback in the shape – excellent! No need for additional thwarts. No need for decks or even breasthooks at either end. A nice open boat! The final trick was to deal with the inevitable “oilcanning” in the flat floor. Such floors always want to bend up into the boat unless held flat by some sort of frame. I tried something that worked very well – in fact, even better than straight frames. I milled some treated decking so that is was a half-inch thick and about 2 inches wide. I made 3, each with 45-degree bevels along each side. These were placed amidships and then equidistantly fore and aft. The ends of each were beveled to mate with the chine logs. Then, I supported the boat upright on the horses, with the horses back just a little ways from each end so that most of the floor was unsupported. I set the 3 stiffeners flat on the boat’s floor in epoxy. They were held in place by the aforementioned 50-pound weights while the epoxy cured. This did two things. First, the weight oil-canned the unsupported floor down, giving about a half-inch of camber to the hull section (a good thing, especially when horsing the boat over a sunken log). The second benefit was similar. Each stiffener was bent downward and cured that way. To cover my bets, I later epoxied a swath of 6-inch ‘glass tape over each stiffener. To complete the boat, I ‘glassed the bottom and up each side about 5 inches. I painted her inside and out and spliced a manila painter onto her foreward stemhead. Total out-of-pocket: about $135. She was ready for the First Half but we did not use her until the Second Half. We did, though, conduct sea trials right at Pencil Brook Farm. My Dad was up for the traditional Columbus Day Weekend Opener so we hauled her back to the Hickory Swamp. We didn’t name her yet, she was just “the pirogue”. She poled and paddled around the half-acre swamp as expected – she was very stable and moved with little effort; the seats were just the right height. The real test, though, would come during the Second Half. Not having to carry guns or decoys or waders, two of us middle-aged outdoorsmen suffered no untoward discomfort as we carried (portaged?) the pirogue to its hiding place. I am pretty sure the date was the 24th of October. On our first hunt – a few days later – it was joined by a pushpole and a bag of decoys. I had re-painted a bunch of plastic stool that had accumulated over the years, found in various marshes or along shorelines by my Dad or me. Ten decoys – Mallards and Blacks – with 1-ounce pyramid sinkers for anchors fit in a tarred nylon net bag. Like the boat itself, these were things we could stand to lose. When in “stash” mode, the decoys nestled comfortably beneath the overturned pirogue – which we had dragged through about 50 feet of brushy cover on terra firma. Hoping not to risk losing the pushpole – a length of closet pole with a Herters Duckbill Pushpole Head at one end and a Turk’s Head on the other – I hid it about ten yards away, cleverly concealed alongside and slightly beneath a fallen birch trunk. Perfect! Several of us enjoyed this little craft at the beginning of the Second Half. We enjoyed being in a beautiful marsh in a pretty boat – and one that was much quieter than our usual tin canoes. She was becoming a Favorite Boat. And so, as the season unfolded, we looked forward to each next encounter with her. Such was our anticipation shortly after Thanksgiving. Here at Latitude 44 North, winter can come early and slow-moving waters frequently turn to ice while there is ample season remaining. In a typical year, we move our pursuits to the rivers in late November or early December. So, when Cap’n Fencepost and I planned the last hunt for the year in an ever-icier swamp, we had a special expectation, looking forward to a once-per-season bonus. There is a bonus to the last hunt of the season because you not only get to take the boat with you, but you get to paddle it right back to the car. We get to enjoy what we call “The Victory Lap”. Instead of trudging, heavily-laden, down a long mile of lumpy trackbed, we simply paddle, silently, almost without effort, because the last mile is now on the river, clipping along at a brisk walking speed. The paddles are only needed for the occasional course correction. When there are a few fat Mallard or Black Ducks piled atop the gear in the boat, it is one of those feelings that is just hard to beat – all is well with the world. Well…I did not name this story “The Lost & Found Boat” for nothing. With a little fresh snow falling all around, Fencepost and I arrived in that magical pre-dawn gloaming. We hauled ourselves along that mile – the last time this year! – and slid carefully down the tall embankment. We quickly found our way through the brush, right to where the pirogue…should have been. ‘Twas gone. No trace. No boat. No bag of castoff-but-rehabilitated puddler decoys. And no pushpole! Anyone could stumble across the boat, and of course the decoys, but how did they find that pushpole? Any hunter is used to disappointment. It is the losses that make the wins so rich. Nevertheless, we quickly came to wish that this had never happened. We looked around for a few minutes, hoping everything had simply been borrowed and perhaps returned not far away. And maybe I misremembered the prostrate birch. We would conduct a “good faith” search, as one might for a downed bird – we would spend a few minutes looking. The search turned up none of the missing articles but we might have found one clue to its disappearance. In glancing back up the embankment, thanks to the fresh snow, I could clearly see something that had not caught my eye on earlier expeditions. There, up in a tree on that steep slope, with a commanding view of the stash, was a tree stand. No hunter occupied it today but…he could easily have overseen our secreting of the pirogue et cetera at the end of our previous hunt. Such a vantage point would render my attempts to hide the pushpole downright silly. Oh, well. We’ll never know for sure. The date was November 24. The hundred-dollar boat had “lived” for one whole month. This story lay mostly fallow for a long time. I built another with Cap’n Fencepost a couple of summers later. We put a little tombstone transom on his so he could mount a trolling motor. This pirogue, too, was a success. Always stored safely at home, it still serves its purpose today. And, of course, the story was a good story, especially at gatherings of duck hunters. It was told more than once. Were that the end to this tale, I suppose the title could have been “The Purloined Pirogue”. But, ‘twas not to be – and such a title would not accurately reflect the historical record – or at least not the facts as I have come to understand them. Before picking up the thread, though, we must first ponder the concept of “search image”. 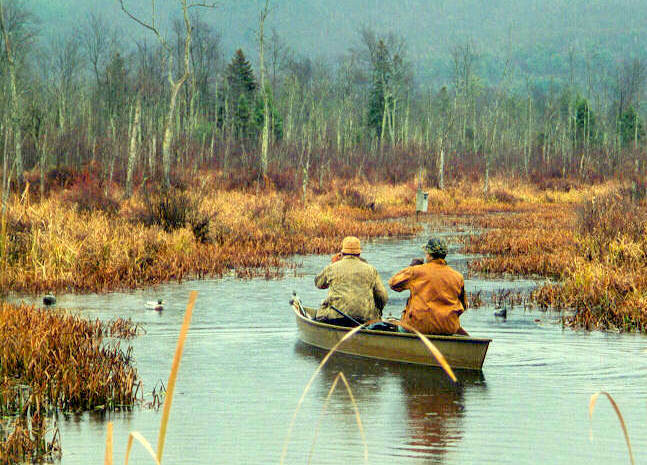 One of the many, many unmarketable skills developed by most hunters involves “search images”. We sit for long hours, scanning skies, after long practice being able to distinguish one species from another at considerable distances and in all kinds of light. 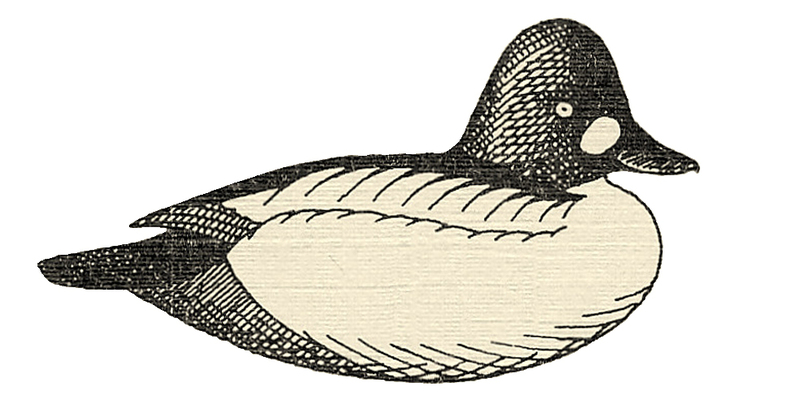 We first can tell ducks from gulls but soon can tell Blacks from Broadbill from Butterball from Shelldrake. We also get pretty good at finding birds that went down where they were not supposed to. We are successful when our search image is firing on all cylinders. Many of us also develop search images useful in our non-hunting lives. One of the search images I carry around with me – along with those for birds, wildflowers, vintage vehicles, traditional architecture, any wetland – is for boats, especially my kind of boats. There’s not much in a modern marina that will trigger my search image, but a boatyard with its share of older craft, especially of the wooden or workboat persuasions, is likely to excite a few of my optic neurons. A sweeping sheer, a plumb stem, a bit of tumblehome and I am “all eyes”. However, I live in dairy country now, so these particular neurons are excited only infrequently. But the search image troops remain always on duty, always ready to answer the call. Such a call came the year my daughter Emily married Folke, ten years after I had last seen the pirogue. For about 16 years, I drove to work in Albany, about 32 miles from our farm. It was not a bad commute, and much of it near home is serenely beautiful. Nevertheless, I tried to mix it up a bit. At a minimum, I would take the long, scenic way heading to work and the shorter way homeward. It was on the homeward route, in June of 2010, that my “watercraft” search image answered the call. I was driving homeward so I was on the shorter “southern” route. All of my search images were in standby mode, ready to go when called, but none fired until just a couple of miles from home. My eyes always check out any waterbody so they were pointed to my right as I passed a fine old home that had a small pond behind it. It’s actually a “three-fer” because there was usually a canoe or 2 on the bank of the pond – traditional architecture, wetland, watercraft. But today the view was different. Next to the barn, almost out of sight, someone had piled 3 small boats. Two were canoes but the one in the middle, with just about a foot of its nose pointing toward the pond, was a straight stem. And, that straight stem appeared to be sporting a coat of Parkers Marsh Grass – albeit a bit faded. The view lasted perhaps a full second – 60 miles per hour being a mile-a-minute and all that – but I was certain. As certain as any parent is when they glimpse even a small portion of their child. This was one of my offspring. The prodigal pirogue? –purloined? – peripatetic? In any event, the pirogue had returned! I am one who prefers never to jump to conclusions. I like to gather facts and draw reasoned inferences and plan responsible actions. I prefer to avoid mistakes. I will never be a good Grouse hunter because things just happen too fast in the Grouse woods – I need to be sure of my target before I even think of raising the gun. I like to think I am one who does not shoot first and ask questions later. And so, although my mind was indeed racing along, I gathered some more information – by driving around the “block”. Bear in mind, though, that a block in dairy country is nothing like a block in a city or suburb. I probably added a good 6 or 8 miles to my homeward journey but I just had to get another look. I just kept heading off to starboard until I found myself back at the lovely home – but this time from a much better perspective. No doubt at all – this was the errant pirogue of days gone by. I did not tarry – I headed homeward once again – but with my mind racing, this time in “Next Steps” mode…. Even a very good life has its share of “difficult conversations”. Here, certainly, was one such conversation looming on the near horizon. It would call for the summoning of all the skills and wisdom I had garnered over the decades, both on and off the job. Some things were clear: no one had stolen anything and I knew the risk I had been taking from Day One. Any encounter needed to get off on the right foot; I did not want anyone to feel accused. It was equally clear, too, that I wanted to – I had to – visit my boat again. But what did I really want? As I had been taught to ask: What is the “desired outcome”? Well, the answer was really quite simple. When I built the boat, the plans were really just the starting point. The molds – which I still had up in the loft – had locked in some of the design, but much of the design happened during the build itself – the method known as “rack of eye”. As happy as I was with the result, I did not have “as built” drawings. Everything had transpired so quickly in that autumn long ago. Surely I would have time to take her measurements after the season…. My desired outcome was to borrow the pirogue back just long enough to take all of the critical measurements. This could not be done in situ; I needed her back on the flat floor of my shop to get the accuracy I needed. Sure, it would be nice to get the boat back – but it was more important that I be able to build another just like it – if and when the spirit moved me. I did not know the new owner, but I was pretty sure who he was. I also knew that Cap’n Nemo – another of my gunning partners – would know for sure. A quick call confirmed my initial hypothesis. The new owner – I will assign him the moniker of “Phil” for this tale – worked away from home during the week. The approach should be in person – always better than a phone call – and it should be on the weekend. Saturday morning when everyone was up and about was probably best. I would stop by on my way back from the lumberyard. I would not yet be sweaty and dirty – my usual weekend condition from one project or another. Susan and I were both going full-bore in the pre-wedding mode, getting the farm ready for 75 relatives and friends in just a few weeks. Perhaps I should wear a T-shirt festooned with fewer paint spots – maybe even pull out all the stops and don a clean polo shirt! I also had to plan my presentation. Each word needed to be selected with great care. I would never attain my desired outcome if the initial encounter wound up in the ditch. I had time in the preceding weeknights to find some photos of the pirogue. I shuffled through the shoebox of prints – mostly gunning and boat photos – and found an extra I could leave with Phil. I wrote the “provenance” on the flipside along with my name, phone and address. I am never a fan of “unsupported assertions” and wanted to establish my credibility. So, armed with the annotated photograph, I pulled into Phil’s driveway on a beautiful Saturday morning on my way home with lumber on the roof rack. Phil’s wife greeted me with a warm smile at the back door. I explained my purpose: “I am interested in that wooden boat over there. I built it several years ago and it sort of disappeared. I just noticed it while driving home the other day.” Hmmm. Did I see the briefest of shadows cross her face when I uttered those words? Was it the wrong thing to say? Did I imagine that her response was not unfriendly but her voice noticeably flatter – just even-toned? “That’s my husband’s. He is not here right now.” I showed her the photo, front and back. We left it that he would call me – or I would call him – I no longer recall the details. I do remember leaving a message with a young son, thinking: “O, man, I would rather have gotten the answering machine”. The weeks went by and the lack of followup was a bit worrisome. Was Phil avoiding me? I am seldom one to let things go. I try to adhere to Lincoln’s way: “I walk slowly, but I never walk backward.” I would just wait until I had time to pick up the trail. In fact, the old pirogue was not that important at the time. The wedding was looming ever larger and work was not getting easier. In fact, I had to be away in San Francisco for almost a week, right before the wedding. First things first. Sure enough, Phil did call. Susan answered the phone – about one hour before Emily and Folke would be tying the knot here at the farm. She explained that we were a bit busy right now but would call back soon. Phone tag ensued for the next couple of weeks – we had a house full of guests for about a week after the wedding – but a meeting was finally arranged. Our face-to-face was anything but confrontational. Phil and I have many common interests and I enjoyed a nice hour of conversation that jumped from boat to hunting to land use planning to traditional architecture. He filled me in on the recent wanderings of the pirogue and agreed to let me borrow it for measurements. I kept it for about a week. I took lots of photos, made a few minor repairs, and touched up the paint with the little bit of Marsh Grass I had on hand. I’ve got a page full of sketches and measurements and have very good intentions of drawing up formal plans someday. And, I might even build another – someday. Cap – I never did hear the latter half (found) of this tale! Ever the diplomat, you sir, are amazing!